90% of people with tinnitus also have hearing loss. Tinnitus affects 1 in 5 people. Tinnitus can be caused by hearing loss, an ear injury or a circulatory system disorder. Hearing loss is twice as common in people with diabetes compared to those without. Adults whose blood glucose is higher than normal but not high enough for a diabetes diagnosis, have a 30% higher rate of hearing loss compared to those with normal blood sugar. There is a significant association between high blood pressure and untreated hearing loss. Hypertension can be accelerating factor of hearing loss in older adults. Higher body mass index (BMI) and larger waist circumference are associated with increased risk of hearing loss in women. A study linked osteoporosis and hearing loss, theorizing that demineralization of the three middle ear bones may contribute to a conductive hearing impairment. People with mild hearing loss (25dB) are 3 times more likely to have a history of falling. Every additional 10 decibels of hearing loss increases the chances of falling by 1.4 times. The inner ear is extremely sensitive to blood flow. Studies show that a healthy cardiovascular system – a person’s heart, arteries and veins – has a positive effect on hearing. 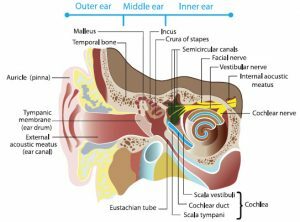 Inadequate blood flow and trauma to the blood vessels of the inner ear. Vision helps you identify where a sound is coming from. If you have vision and hearing loss, your ability to target sound location is compromised. The amplification from hearing aids helps compensate for the vision loss. Adults 50 years and older with untreated hearing loss are more likely to report depression, anxiety, anger and frustration, emotional instability and paranoia than those who wear hearing aids. There are more than 200 medications on the market today that are known to cause hearing loss (toxic to the ears). The list of known ototoxic drugs includes Aspirin, Quinine, Water Pills, Certain Antibiotics, Some Anticancer Drugs, Some anesthetics, environmental chemicals like carbon monoxide, hexane and mercury. The World Health Organization warned in a recent report that over a billion young people are at risk for permanent hearing loss. One of the main culprits is a widely used device for listening to music — the smartphone. “Anything where you’re putting sound into the eardrum, that’s something as a society that we need to take a closer look at,” says Rex Banks, chief audiologist at the Canadian Hearing Society. That’s because loud noises damage the cilia of the inner ear, the tiny hair-like structures that change sound waves into electrical signals that are carried to the brain. The damaged cilia never grow back. “Once they’ve been damaged, that’s irreversible,” says Banks. A normal speaking voice usually measures around 60 decibels. Volumes above 85 decibels will cause damage after about eight hours, and levels above 100 decibels can do so in 15 minutes. But measuring decibel levels is impractical and complicated for most people. One solution to the problem could be noise-canceling earphones that can block ambient sound and allow music lovers to listen to their music at lower and safer volumes. There are also built-in safety options for most devices. Apple introduced a way of limiting the volume on its iPod and iPhone devices after a 2006 class action lawsuit accused it of not taking adequate measures to protect its customers’ hearing. Google has introduced similar volume-limiting apps for its Android devices. But Banks warns that none of these features is perfect and nothing should give you license to expose yourself to as much noise as you want. He says the best strategy is to remove, reduce and rest: Remove yourself from prolonged loud sounds, reduce the amount of background noise around you and give your ears a chance to rest and recover. Prevention: The best way to deal with Noise-Induced Hearing Loss (NIHL) is to stop it before it happens. Buying headphones instead of earbuds keep some of the direct sounds out of teens’ ears. Ear protection should always be used in loud environments like concerts, sporting events and when operating power equipment. If teens do experience symptoms like ringing or buzzing in their ears, they should immediately turn down the volume, wear ear protection, or see a hearing care professional.